In keeping with The Legal Genealogist‘s Christmas tradition of keeping the blog going while scrambling to handle holiday duties, this post (a reprise from years past), has a question for you: are you planning for a good Christmas holiday? And, with apologies to all of our first responders and health workers and others who do have to go in over the holiday, isn’t it terrific not having to work? Well, all I can say is, you sure should be celebrating your day (or those days) off. Because it certainly wasn’t always that way. It hasn’t even been that way for very long. And note that that law only said within the District of Columbia. 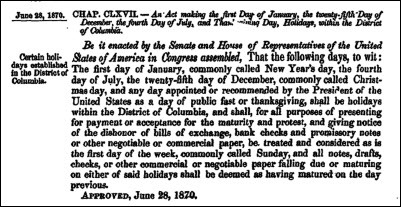 It wasn’t until 1885 that federal employees outside of the federal enclave in which the capital city of Washington is located also officially got the day off.3 Oh, some departments had been closing unofficially before then4 but the law itself didn’t require it. But, you say, surely the states recognized Christmas before then! Well, yes, they did. But not all that much earlier. And not all of them — some didn’t come around until later. So don’t be surprised if you come across an official document or court record well into the 19th century featuring some action involving your ancestor on Christmas Day that has nothing to do with gifts, reindeer or figgy pudding. Now… aren’t you glad you can sit there and plan for your time off this holiday? Well that is something that I didn’t expect. Very interesting. Thank you for sharing Judy.